Remember your people Lord! Look with mercy. A cry rises from the land of rebellion. Ephraim and the northern tribes turned away from the Lord after the civil war with Rehoboam. The Kingdom spilt in two: Israel in the North and Judah in the South. Jereboam, king of Israel, built his own temple to keep the northern kingdom from going to Jerusalem for worship and sacrifice. His rebellion turned the people into idolators. And yet, here in Psalm 80, we hear a cry for the Lord to turn and have mercy on Ephraim. The psalmist cries, “You have fed your people with the bread of tears and given them tears to drink in full measure.” This psalmist is crying out for God to remember his people even in their rebellion. This psalm could be a prayer for once Christian nations that have been seduced by other gods like America, Great Britain, and all of Europe. This psalm could have been prayed for the people of Southern France in the second century. The Christian community of Lyons were being seduced by teachings that appeared to offer deeper truths to the Christian life, but these truths were ultimately rejections of the good news of Jesus Christ. In Psalm 80, enemies have surrounded the nation and like a wild boar are coming to devour. He is desperate for the light of God’s favor to shine with power and might. He longs for the Lord to look down, remember his people (even in their rebellion), and to revive them and lead them back to the safety of His love. Now, who is this psalmist? We don’t really know. We don’t know if he’s someone from Judah that is praying for Israel because they have abandoned God. Or, is it one of the faithful that have remained in Israel? We are told that over 7,000 have not bowed the knee to Baal (I Kings 19:18). We know that there is a remnant of faithful people in the land of Israel. We don’t know who prays Psalm 80, but we know that he is of the house of Asaph. He’s a psalmist in the Asaphic tradition, so we know that at least. He’s either in Judah or Israel; but he is praying for a nation in rebellion. The Bishop of Lyons, Irenaeus could have prayed a similar prayer for his people. As he pastors the Christian communities spread across Lyons, he wants to protect the faithful from the devouring boars, from the seducing voices who would lead them astray. He writes a series of little books against the heretics, exposing the danger of the various Gnostic teachers that have come into the midst of God’s people. We may never have even heard of Ireneaus if not for this conflict. As so many in Christian history, they would have faded with time, because it’s hard for us to grasp, in American especially, in a culture of everything bigger than life, that many of the Christian communities throughout history were small groups of people seeking to be faithful to God. When Paul writes the people in Ephesus, they’re not even allowed to participate in the commerce of Ephesus. They’re small groups of people. He tells them that they rule the universe with Christ, in Ephesians 1. Now, a little background in Irenaeus: He’s just too generations away from the first … for the last apostle. Irenaeus, in his own testimony, said he was trained by Polycarp. Polycarp was a ordained bishop. According to Jerome, Polycarp was ordained bishop by the Apostle John. Irenaeus has grown up close, very close, to the apostolic tradition. In fact, of all the church fathers, he is the closest. He begins to write and defend the gospel. He is literally defending what has been handed down to him by Polycarp; and what was handed down to Polycarp by John the Apostle. Some people refer to Irenaeus as the father of the church fathers, or the grandfather. Because it’s out of his pen that much of church theology has been shaped. He’s not the very first Christian writer, but he is, in fact, the first theologian. He’s the first one that thinks deeply about the implications of the gospel of Jesus Christ, and what it means for the world, and what it means for culture. As we’ll see today, many of the truths that we take for granted came from the deep reflections of Irenaeus. He’s thinking upon the implications of God, become man, and Jesus Christ. Throughout his writing he sounds the joyous note of gospel proclamation. In his writings, we hear the good news of God shining out in the light of Jesus Christ. In his books, Against the Heretics, Irenaeus addresses teachings from some of the leading Gnostics. While they differ in details, they all focus on the secret revelation handed down with the faith. Whereas Irenaeus contends the Gospel has been handed down by public proclamation rooted in the eyewitness testimony of the first disciples. Jesus reveals the Father, and there is no secret God behind the face of Jesus. The Gnostics lay out elaborate schemes of creation, and Irenaeus says that their systems are, “abstruse, and portentous, and profound mysteries, to be got at only with great labour by such as are in love with falsehood.” They ended up denying the goodness of God’s creation and seek some of kind of spiritualized state. Plus, each of the Gnostic teachers are at odds with one another. As Irenaeus defends our faith, he ends up quoting most of the books that we now consider books of the Bible. So he lays the foundation for a public faith handed down publicly, but also for an Old and New Testament canon that we consider the Word of God. God created a good world that bears witness to His glory. God glorifies our whole person by His Spirit. God created a good world that bears witness to his glory. God intends to build relationship with humans in this created world. Though he stands outside of the limitations of his creation, he sustains this world and his people by his goodness. Just to pause briefly over this quote, “The life of man consists in beholding God.” If I’m following what Irenaeus is saying, beholding God is not trying to achieve some mystical state that is non-creational. It is beholding Jesus. I return again and again to the Gospels. I return again, again to Scripture and ask, “Father, reveal to me yourself in Christ.” All Scripture is bearing witness to God’s redemption in Christ. I continue to return my eyes to Christ. Then, inwardly, God’s Spirit is speaking to me as well. Inwardly, I am being renewed. That faith is becoming personal in me. This is one way the church fathers speak about it. Outwardly, I’m hearing the call of God; but by his Spirit, I’m hearing it inwardly at the same time. That’s that personal encounter with Christ. When I talk about a personal relationship with Christ, somehow that relationship is not separated from the rest of the body. My personal relationship is what the Spirit is bearing witness to the truth that has been proclaimed in Scripture. My personal relationship is rooted in the revelation of Jesus Christ. Irenaeus shows us that gnosticism, on the other hand, is leading us away from the created world. In fact, it’s leading us away from all truth. We can’t trust anything. Everything is an illusion. Faith is leading us into the world. As a result, and the implication might not be obvious, but as a result of Christ, I can study the sun for the sake of the sun. I can study the rocks for the sake of the rocks. Just because they’re beautiful. I can go to the mountains just for the sake of their beauty. I don’t … it doesn’t have to be some kind of spiritual mystical thing; but it might. Christ might encounter me in the midst of that, but I don’t have to make … The world is beautiful for the sake of the world. God has created it that way. This allows for science, which the reformers will rediscover, actually, this truth of Irenaeus. This will play a key role in the formation of science, that we can study the world for the sake of the world. The world is not an illusion. It’s real. Even as it reveals the love of God and Christ, it is real and important for it’s own sake. Gnosticism ultimately leads us away from the created world, whereas as faith returns us to behold the glory of God’s creation. 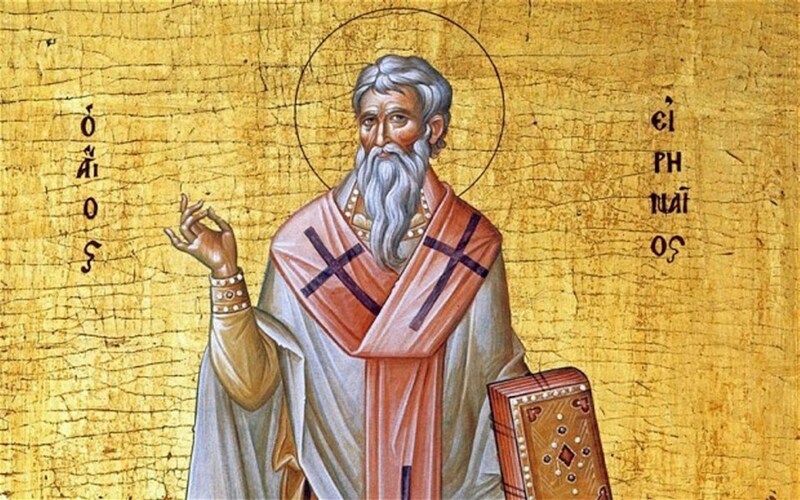 Irenaeus teaches that gnosticism offers a dazzling beauty to the mind, but it is a spiritual frenzy that ultimately disappoints and leads us into emptiness. We soon come to treat the created world as illusion or as simply a step toward some abstract idea. The Gospel on the other hand, brings us back to the glory of this world. Three simple truths that we may even take for granted today, but we can thank the Lord for people like Irenaeus and their faithfulness to articulate the gospel in their era that we have heard this Good News. May we also join the Psalmist in praying for God to restore us and make His face shine upon us. May we daily turn our faces to God in Christ, asking Him to renew our faith and granting us grace to reveal His love and truth in day to day encounters with our co-workers, friends, and family. John M. Frame, A History of Western Philosophy and Theology, 1st Ed. (Phillipsburg, NJ: P&R Publishing, 2015), 94. For a reflection on these points, see Farrow, Douglas B. “Irenaeus of Lyons (c. 130–c. 200).” The Dictionary of Historical Theology. Carlisle, Cumbria, U.K.: Paternoster Press, 2000, pp. 274-275. Irenaeus of Lyons, “Irenæus against Heresies,” in The Apostolic Fathers with Justin Martyr and Irenaeus, ed. Alexander Roberts, James Donaldson, and A. Cleveland Coxe, vol. 1, The Ante-Nicene Fathers (Buffalo, NY: Christian Literature Company, 1885), 490.
 ibid, book 3, chap. 19, 448–449. Amen! Members of a Christian community in which I lived were seduced by a charming stranger who took half dozen of them on trips of the spirit throughout the nation and the world. These were exciting, glorious expeditions, I heard. I may have engaged in these forays into this spiritual world except that, by the time I was open to the idea, it was revealed that this man was having an affair with a wife and mother in the church. I thank God regularly for dodged bullets! Thanks for your good Word, Doug.